Occasionally the Democratic Republic of the Congo and Tanzania are included in discussions of Southern Africa, though they are more commonly reckoned in Central and Eastern Africa respectively. Recently, a move has begun in Southern Africa to unite the region economically, socially, and politically. Two organizations formed to foster this unification are the Southern African Development Community (SADC) founded in 1980, and the Southern African Customs Union (SACU), created in 1969. The natural beauty of Southern Africa is in sharp contrast to its human history and the current political and social situations. Its history is rife with sad stories of the slave trade, colonialism, tribal warfare, genocide, poverty, and apartheid. Most of the nations, having gained independence and becoming established as nations only within the twentieth century, have faced corruption of power and wealth on the part of its political leaders and ruling families. The HIV/AIDS epidemic runs rampant throughout the region. It is imperative for any governing body to confront these problems and their aftermaths. Education, justice, and shared prosperity must be provided, on the basis of strong moral ethics and family structure. Plans for sustainable development allowing for prosperity as well as protection of the environment must be put into place. Geographically, South Africa is defined through a series of plateaus that stretch across the nations of South Africa, Namibia, Botswana, and the central portion of Angola. Within the plateaus, a wide variety of notable ecoregions exist, ranging from the grasslands in southern Zimbabwe to the vast Kalahari Desert. The Kalahari desert is featured in the South African plateau, and eventually rises to become the Great Escarpment. The area is defined by the sharp line of the Great Escarpment, which continues almost unbroken from the Zambezi River to Angola. Another notable mountain range in the region is the Drakensberg Range. This range boasts the highest point in Southern Africa, found at Mount Ntlenyana in Lesotho. Southern Africa hosts a wide variety of wildlife, although the animal population varies depending on the location within the region. In the semiarid plateaus which cover most of the region, Southern Africa exhibits much of the big game wildlife seen in the northeastern portions of the African continent, in particular antelopes, gazelles, zebras, elephants, and the big cats. Coastal areas of Southern Africa do not host the same varieties of big game that can survive on the plateaus. In terms of natural resources, the region has the world's largest sources of platinum and the elements chromium, vanadium, and cobalt. The region also boasts uranium, gold, titanium, iron deposits, and diamonds. Scholars often have difficulty defining the history of Southern Africa along the traditional linear lines of history. The continually changing political scene has jumbled the historical archives with a variety of sources, all written from a different point of view. As with any historical record pieced together from a variety of sources, it must be remembered that the authors of the historical records in the region all had separate agendas for recording the past, which changes with every passing political regime. Southern Africa was the home to Homo erectus, an early hominid species with upright posture and hands and teeth resembling modern humans, according to the archaeological teams that have canvassed the region looking for evidence of early life. While many people believe that Homo erectus was a vital link in the evolution of humankind, the connection between H. erectus and modern–day humans is still disputed by a minority of scientists. While followers of the theory of evolution point to the find as a huge step in discovering the human past, there are some creationists who do not choose to believe that humans underwent a process of evolution. The debate regarding the presence of evolution is deeply intertwined with the history of Southern Africa, as the remains that are being found in the region often date prior to the Early Stone Age (about 2,500,000 to 150,000 years ago). The remains cement the debate over the validity of evolution and bring it down from theoretical heights to the tangible. If evolution exists, the Homo erectus remains found in Southern Africa document an early form of humans who called the region their home. The remains of early Homo sapiens in Southern Africa document human civilizations reaching back 120,000 to 80,000 years ago. The most significant find for dating early human occupation was found at Klasies River Mouth Cave in Eastern Cape. The existence of early humans in Southern Africa led to an overall diversification, where humans were forced to adapt to a variety of different circumstances. This is most clearly seen through tools, as different areas across the region show a variety of tools that have been adapted to meet the most pressing needs of the area. Some scholars also argue that early Homo sapiens brought about an agricultural revolution and shifted the society from hunting and gathering to settled production. When European explorers first reached the region, they were unable to differentiate between those individuals who continued to practice a hunting and gathering lifestyle and those who practiced settled, agricultural cultivation. The divisions between lifestyles was particularly difficult to distinguish near the Cape of Good Hope, located on the southernmost tip of Africa. In an attempt to classify the people met on their travels, the Europeans simply called all inhabitants of the region Khoisan. In the fifteenth century C.E., Portugal established a presence in Southern Africa while seeking a way to open up naval trade with India. The first, and perhaps most famous, Portuguese adventurer to reach Southern Africa was Vasco De Gama who sailed along the entire coast of Africa on his way to India. The first Portuguese incursions in the central portions of Southern Africa was the work of churches who were set on converting the native population. Soon after the missionaries made contact with Southern Africa, slave traders entered the region. With the Portuguese slave traders always willing to enter the market, the Kongo developed a complete monopoly over the slave exportation out of the southern portion of the African continent. Southern Africa fell under the control of Great Britain in the early nineteenth century, a fact that was marked by the development of the Dutch East India Company from a small outpost to a bustling metropolis of over 22,000 white settlers. After the Napoleonic Wars ravaged Europe, a humanitarian effort began which vigorously campaigned against slavery. The force of the movement was so strong that in 1807, they succeeded in persuading Britain to abolish the slave trade. The criminalization of slave trading caused a shift in exportation from Southern Africa, leading ivory to take the place of slaves as the main export from the region. The ivory trade had much the same political consequences as the slave trade in the region, and various groups began to wage war over land rich with the source of ivory, elephants. Southern Africa entered a period of turmoil in the early decades of the nineteenth century, lasting until the end of the century. It was a period of tribal warfare whose initial cause is debated but is most often understood to have been competition for trade. Devastating droughts and the decrease of the slave trade precipitated this. Battles over land ensued. The Zulu king Shaka rose to power in the years just preceding 1820. His military brilliance led to the emergence of the Zulu as the most powerful group in the region. Shaka succeeded in consolidating numerous chiefdoms into a centralized military state. Shaka led a decade of turmoil and warfare as opposing tribes were conquered and absorbed. Though he was the leading military power, tribal warfare did not end with his assassination in 1828. Unrest continued for the remainder of the century as tribes conquered one another, the weaker often fleeing to neighboring territories to escape the onslaught. The modern day nations of Lesotho and Zimbabwe were the destination of many, while the Kololo even crossed the Zambezi River into northern Zambia in west-central Africa. Here they fought and defeated the local Lozi kingdom. Though their reign was short-lived, the language of the region continues to be a variant of the Kololo tongue (Sotho). The Ndebele, led by Chief Mzilikazi, set up a caste-like system in conquered territories. Though relationships with some were friendly, many chiefdoms under his domain but outside the reach of his armies began trading firearms by the 1870s, in order to strengthen resistance. The British had remained in South Africa during this time to protect their holdings, most especially the trade route to India. Though their rule was color-blind in some areas, in the majority of places it was not. In 1857, the internally divided Xhosa turned to millenarian prophecies which taught that the slaughtering of their cattle and destruction of their crops would raise their ancestors from the dead, who would then assist them in re-establishing their sovereignty from the whites. When this failed to occur, 30,000–40,000 entered the colony seeking work, while an equal number died of starvation. The turn to the prophecy brought the end of Xhosa political and economic integrity, though the eastern tribes had continued their resistance for a short time afterwards. Following this, the annexation of the remaining African territories proceeded peacefully and the last of the independent kingdoms passed into their hands in 1895. The discovery of diamonds in 1867, and gold in 1886, encouraged economic growth and immigration, intensifying the subjugation of the natives, leading to the Boer Wars and eventually the creation of the Union of South Africa. The history of South Africa and its relationship with its neighbors in Southern Africa is a complicated one, due in large part to the expansionist desires of the British. Often it was the white population who reaped the benefits of the exportation of natural resources, such as diamonds and gold. They controlled private property as well as the police and armed forces. Among the white settlers themselves were division based upon class and ethnicity. Political struggles among whites were bitter especially in South Africa, South West Africa, and Southern Rhodesia. In South Africa in 1934, the South African Party and National Party merged to form the United Party, seeking reconciliation between Afrikaners and English-speaking "Whites," but split in 1939 over the Union's entry into World War II as an ally of the United Kingdom, a move which the National Party strongly opposed. In 1948, the National Party was elected to power, and began implementing a series of harsh segregationist laws that would become known collectively as apartheid. Throughout the region of Southern Africa, independence movements began springing up in the 1950s. While South Africa sought the annexation of Lesotho, Botswana, and Swaziland, these nations were ultimately able to secure their own elected governments. Malawi and Zambia gained their independence in the 1960s, through strong and diplomatic leadership, while Angola and Mozambique suffered all-out war before gaining their independence. Namibia did not gain independence until the 1990s. South Africa's system of apartheid became increasingly controversial, leading to widespread sanctions and divestment abroad and growing unrest and oppression within South Africa. In 1990, the National Party government lifted the ban on the African National Congress and other political organizations, and released Nelson Mandela from prison. By 1995, they removed apartheid legislation from the statute books. 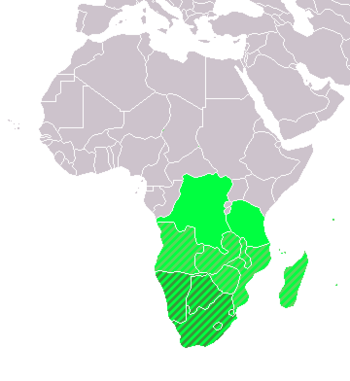 The population of Southern Africa can be divided based on language, with the overwhelming majority of inhabitants speaking either Khoisan or Bantu. Each language is attached to a distinct cultural identity, and unfortunately, the two cultural groups have often been at odds with one another. The first group, Khoisan speakers, were the first cultural group in the area and have called Southern Africa their home since the habitation in the region first began. Recently, Bantu speakers have began to outnumber the Khoisan speakers, resulting in a displacement of the minority group. Colonialism had a significant effect on the population of Southern Africa by altering the traditional cultural balance in the region. European settlers in the mid seventeenth century brought to Southern Africa distinct ideas about cultural values and traditional kinship groups. While the Europeans were never the majority, they exercised considerable influence on the politics of the region. The most poignant impact of the European settlement was the legalized apartheid in South Africa that separated the native population along kinship lines. Apartheid was dissolved in 1994. Currently Southern Africa, like much of the African continent, is attempting to combat the AIDS epidemic sweeping the region. Because the political governments in Southern Africa are forced to fight the disease on such a large scale, as well as finance programs to combat poverty, valuable resources are being diverted away from the government. The financial drain is aided by corrupt politicians, a problem faced in many countries throughout Africa. Southern Africa has recently taken strides to rectify the problems of political corruption and poor economics that have hindered development in the region by developing the South African Development Community (SADC) in 1980. Encyclopedia Britannica. Southern Africa. Retrieved July 25, 2007. This page was last modified on 2 April 2008, at 16:47.